Brush, dab and spray your way to an easy, exciting, colorful project with these big, bold Liquid Watercolor™ paper shapes. 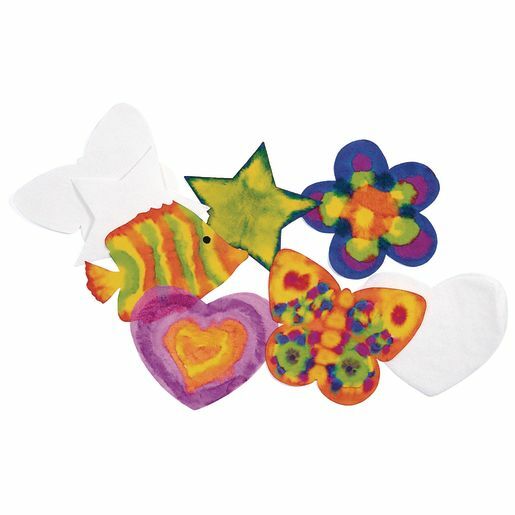 This super pack includes 100 shapes - 20 each of 5 fun designs: fish, butterfly, star, heart and flower. Each design is approximately 9"W x 7"H.
100 shapes for you to design! Instant customizable art that lets imaginations grow! Why should you use Liquid Watercolor™ Paper Super Shapes as part of your Arts & Crafts curriculum?